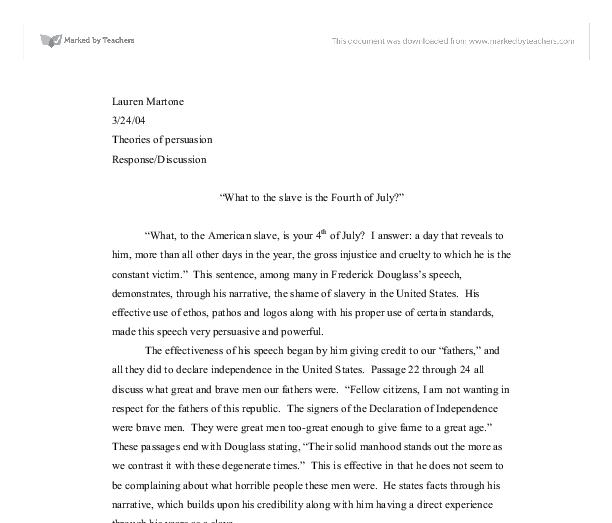 Lauren Martone 3/24/04 Theories of persuasion Response/Discussion "What to the slave is the Fourth of July?" "What, to the American slave, is your 4th of July? I answer: a day that reveals to him, more than all other days in the year, the gross injustice and cruelty to which he is the constant victim." This sentence, among many in Frederick Douglass's speech, demonstrates, through his narrative, the shame of slavery in the United States. His effective use of ethos, pathos and logos along with his proper use of certain standards, made this speech very persuasive and powerful. The effectiveness of his speech began by him giving credit to our "fathers," and all they did to declare independence in the United States. Passage 22 through 24 all discuss what great and brave men our fathers were. "Fellow citizens, I am not wanting in respect for the fathers of this republic. ...read more. See, too, that girl of thirteen, weeping, yes! Weeping, as she thinks of the mother from whom she has been torn!" Any person, slave or not, white or black can identify on some level with a situation of this sort. He seems to have a certain gravitas and courage as his foundation and tone. It's as if he knows people will listen to what he has to say no matter what is. He also had a certain form of gentleness by not directly accusing people of the wrongfulness of slavery right away. He doesn't make it as though he feels that people should pay for what they did to the African Americans. He instead complements them on our independence and that people should be happy and proud of our fathers' accomplishments. This is how he sets the common ground for the rest of his speech. ...read more. He has a sense of fidelity within his words which allows him to be angry at the way he and others were treated. It was unfair, and wants to make sure that everyone knows how he feels. I thought the genre of this narrative was effective through its style in that he seemed humble and courageous. He had every right to be angry about the issue of slavery, but he remained well-tempered even when he discussed the wrongfulness of it. He was able to draw common ground for the audience which was done a great deal through his reference to religion and the stories of the bible. Along with this, he concludes with a feeling of hope. "I, therefore, leave off where I began, with hope. While drawing encouragement form the Declaration of Independence, the great principles it contains, and the genius of American Institutions, my spirit is also cheered by the obvious tendencies of the age." 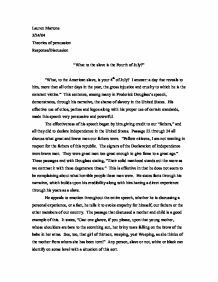 So Douglass goes full circle with his speech, which is an important step in making it persuasive and coherent. ...read more.